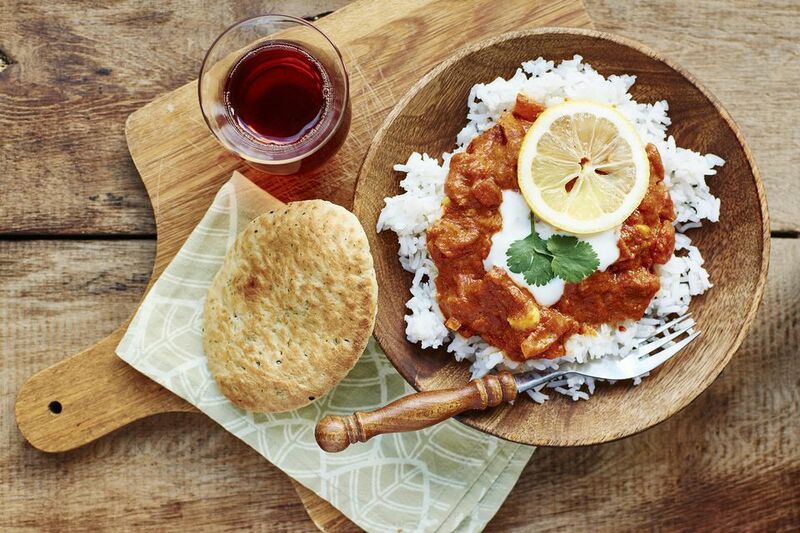 Fans of Chicken Tikka Masala claim it is the new British national dish. It can rightly claim to be a British favourite. This recipe is quick and easy to make and you can adjust the amount of chili powder to how hot you like it. One tsp of chili powder will give you a mildly spiced curry. In a large stainless steel or glass bowl place the chicken with the ginger, garlic, salt, pepper, chopped coriander, lime juice and zest with 1 tbsp of the oil. Stir then cover with a clean cloth, leave to one side for 30 minutes. After 30 mins, heat one tbsp of the oil in a large frying pan or wok add the chicken and cook for 8 -10 minutes until browned all over. Remove the chicken from the pan and put to one side. In the same pan heat the remaining oil and gently cook the onion and chili powder for 5 minutes. Add the turmeric and ground cumin, stir and cook for another minute. Stir in the cream and gently simmer for 5 minutes. Add the chicken and simmer for another 5 minutes. Add the tomato puree, and stir. Finally, add the lemon juice. Cook for one minute more then serve garnished with fresh coriander. Boiled rice, warm naan bread or chapatis are delicious served alongside. This version of Chicken Tikka is very creamy if you like a drier version then check out my other recipe for a drier sauce. Chicken Tikka Masala Recipe also, if you like to watch and learn, there's even a video to accompany the recipe. Despite, or maybe because, Chicken Tikka Masala is considered a British national dish, belief has it; it came from the colonial days of Empire and the Raj. Not so. Without a doubt, the components of the dish do originate in the sub-continent, the finished Tikka is a very British one with many claims to the inventor. Most certainly it is not steeped in history or heritage, it is a product of mass immigration into Great Britain in the 1950's and the rise of Indian Restaurants. There is little chance you will find the cream in this recipe in India.